Derby County have completed the double signing of Watford pair Nathan Ellington and Jordan Stewart. Striker Ellington, who worked with Rams boss Paul Jewell at Wigan, has joined on loan for a year and will complete a free transfer switch next summer. Defender Stewart, also 26, has signed a three-year deal on a free transfer. Jewell told the club website: "If Nathan can reproduce [his top form], he has the potential to be the best signing of the summer in the division." He continued: "I can't wait to work with him again and get him back to reproducing the type of football I know he can. "Jordan is a great acquisition for us and someone who will have a big part to play in our promotion push next season." Ellington played a key part in helping Jewell's Wigan win promotion to the Premier League but his career has stalled since leaving the JJB Stadium in 2005. 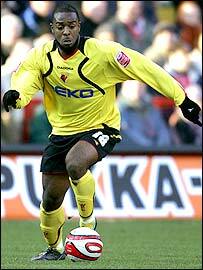 Stewart began his career at Leicester and moved to Vicarage Road in the summer of 2005.